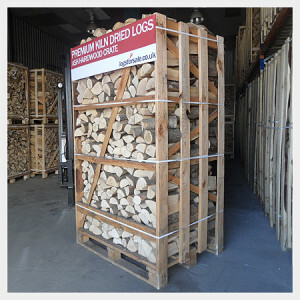 Over the last few years we have noticed a trend within the online firewood industry were many companies are shrinking the sizes of their large or full crates. We have seen our main competitors reduce the size of their large crates by up to 35%, meaning the end customer who may not realise the change of dimensions will not be expecting to receive a crate much smaller than previous years. Not only does this make the logs more expensive when it may appear cheaper, but means customers must purchase again later in the season when their logs pile runs out much sooner than normal. Why are companies shrinking their large crates? Costs of raw materials are rising – it is a fact as many of our customers will know that the cost of sourcing raw materials and producing kiln dried logs does increase somewhat each year, as demand for properly kiln dried logs grows. By reducing the size of crates, companies can appear to still be retaining the same value as previous years when in fact this is not the case. We feel both these reasons for reducing the size of large crates are misleading and can only lead to unhappy and confused customers. We know those of you who purchase large crates do so for the sheer volume of logs and value it represents in comparison to smaller crates, and expect the same size crate each year. Ultimately we believe in transparency and if rises in our production costs dictate a small price increase then we would much rather be honest about this and adjust the price than shrink our large crates. We encourage customers who are tempted by or see cheaper priced large crates elsewhere to always check the quoted dimensions against ours. With our spring sale in full swing and plenty of chilly mornings and nights still ahead, we believe April is the best month to stock up for next season and still get use from your logs in the meantime. As wood will only ever acclimatise to the surrounding relative humidity in the atmosphere, even when stored outside or in your garage, the moisture content of our logs will always remain below 15%. The British climate simply doesn’t get humid enough (for long enough) for kiln dried logs to ever become “wet” again. I would also like to take this opportunity to personally thank all our customers who have joined us this past season, and look forward to supplying the same consistenty low moisture kiln dried logs the next time you need them, no matter what season it is. All year round. Best wishes heading in to warmer weather from the team at logsforsale.co.uk, and don’t forget to spring clean your wood burning appliances – our logs will go a tremendous way to keeping your flue and stove clean, but they still require a professional clean and sweep. We have seen our first snow fall for the season today at our base in the East Riding of Yorkshire, as we send our kiln dried logs everywhere in the UK from customers down south in Brighton right up to Scotland and everywhere in-between. With the forecasters predicting a long, hard winter, we’re working hard with our supplier to ensure we’re in full stock for the winter to ensure our logs are always in stock and ready for immediate burning. Thank you to all of our current customers and we look forward to supplying you all throughout the winter season. Best wishes going in to the winter from all the staff here. We are pleased to announce that our extremely popular natural firelighters are back in permanent stock, and we have secured an unlimited supply to last throughout the entire season. 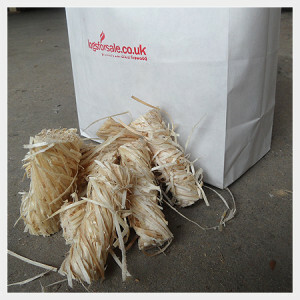 If all you’ve used are paraffin firelighters in the past then these will be a real treat – made from a material called wood excelsior (essentially shredded wood), they are spun in to a thick wood wool rope which is dipped in wax to ensure a long burn, and then individually sliced to crate our firelighters. As the weather starts to get colder in the mornings and late evening as we head in to August, it’s the perfect excuse to stock up with firewood and enjoy a few logs in the evening before Autumn gets in to full swing and the burners find themselves getting used more often. Today we have various packages of kiln dried logs awaiting collection due to be sent to London, Greater London, Middlesex and Berkshire, from pallets of 15 nets to our bulk bag and a 2m huge crate. With our new Economy AM service you can receive your firewood from 8am-12, freeing up the rest of your day. We have also implemented tracking codes on every delivery which means your order can be tracked as soon as it’s on the way to the Palletways hub – we e-mail you the morning after dispatch with the tracking information.